After watching this movie twice, I'm still not sure I know what the titular question is: perhaps a philosophical inquiry into a man's true nature? a study of the real cost of crime to society and individuals? a discussion of whether genuine reform is possible? 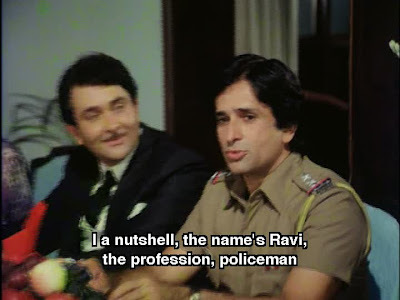 Or maybe the film is just wondering if 1982 is too late for Shashi to play Inspector Ravi Malhotra, a cop with a fresh approach to law enforcement and a devil-may-care concern for his own safety when fighting crime? 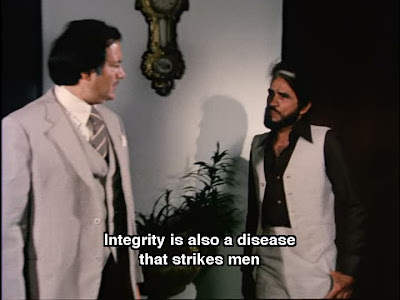 "Kabhi nahin!" the film seems to answer, but our esteemed colleague Post-Punk Cinema Club would disagree. I'm somewhere in between. 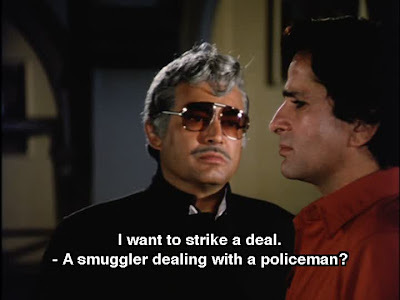 I agree with PPCC that our beloved, stalwart moral and ethical masala hero is looking a little ragged, but at least his co-stars (Sanjeev Kumar as smuggler Dhanpathrai Mehta, a villain who might help the police if the price is right, and Prem Chopra as the even more hardened smuggler Shamsher Singh) are in the same boat. 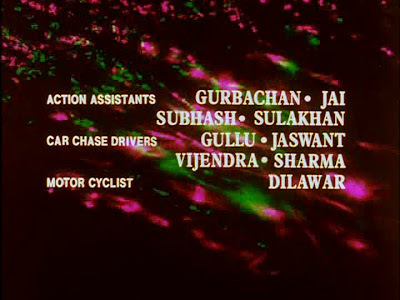 Had the cast included Amitabh and Vinod, I don't think this would have worked as well. 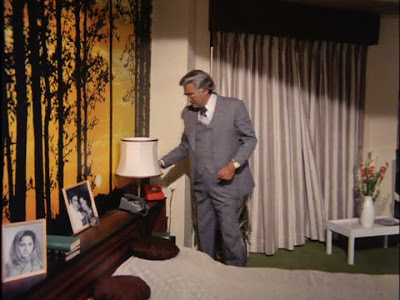 Nothin' says "rich" like room-sized mattress-sofas and scenic photographic murals! 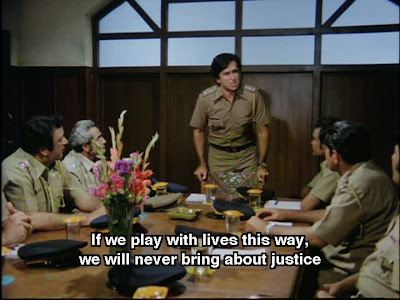 reform but stay quiet, or make the ultimate resolution and turn to the police (headed by Ravi, of course) knowing that his gang's punishment for informants is death? 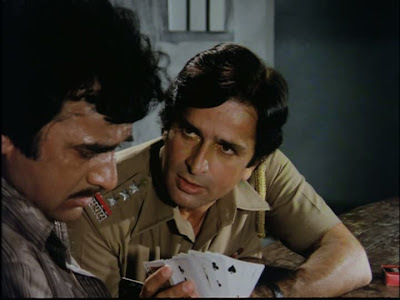 I'll answer one question for you with certainty, though: at 44, Shashi is way too old to be 20-year-old Poonam Dhillon (Sonia)'s love interest. * The first time I saw the characters' initial interaction, I thought the subtitles had typos and they were in fact siblings instead of a couple. Look at them! Look at her baby face! Urk. No, creepy old man! You may not have more than a hug! The less said about this romance, the better. A bad way to start off a week honoring a veteran pyaar-ster and the filmi king of my heart (or king of my heat, as he has said elsewhere), I know. 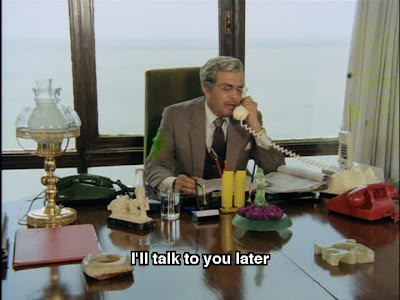 Here's another: I wish this pared-down film had also bypassed comic relief/emotional touchstone/token musical performer Vicky (Sonia's brother) because Randhir Kapoor has all the appeal and grace of a hyper-caffeinated squirrel. It's been a long time since I so badly wanted to strangle a fictional character played by an actor almost 30 years ago. 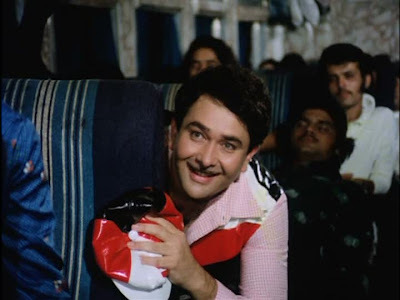 If his performance in Sawaal is at all typical, I'm going to avoid-yaar Randhir Kapoor like my sanity depends on it (for indeed it might). 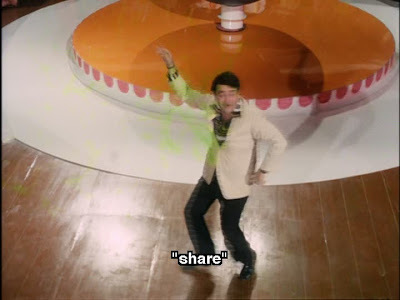 This may not be his fault, but for some reason Randhir whips off his hat at the beginning of the opening song and keeps it in his hand for the rest of the number. 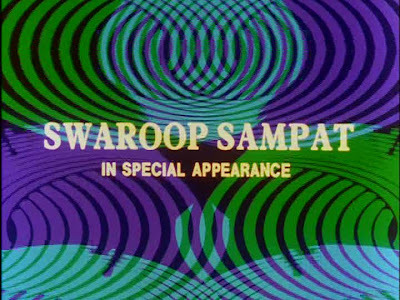 Even while harassing (by which the film means "romancing") Reshmi (Swaroop Sampat - and if my sources are correct, she's married to Paresh Rawal? How cool is that!) - it'd be a lot easier to take her hand if you actually had it free, eh, doofus? 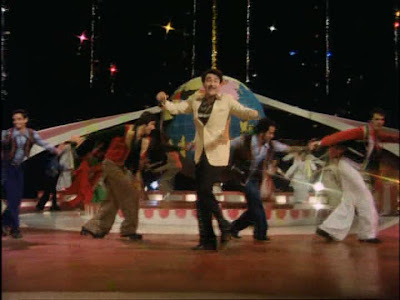 Randhir's other song, "Zindagi Haseen Hai," is a pleasing diversion but didn't do anything special for me. 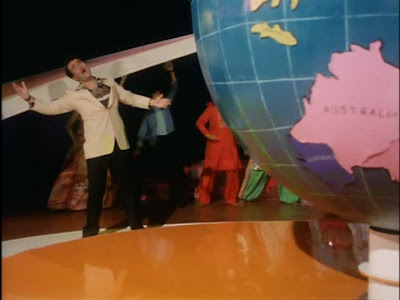 Like Karz's "Om Shanti Om," it features a Kapoor man tippy-toe prancing** around a giant rotating circular stage; instead of a record player, this time we get a globe surrounded by a pink slide and a chorus dressed in various Indian costumes, I suppose in an "It's a small world after all!" sort of way. Vicky is just so very, very irritating. He talks nonstop and very quickly, never letting anyone else speak, and there's something about the way he's always saying "our daddy" this and "our daddy" that that I found creepy. 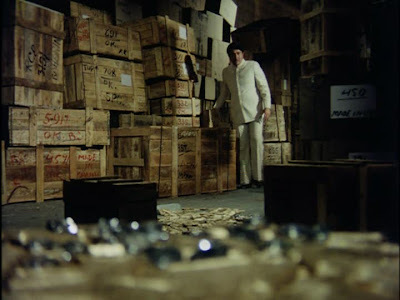 He comes off as stupid, too; I know Dhanpathrai's family is in the dark about his real line of work, but apparently Vicky has not seen any 70s masala films to realize what a giant roomful of crates and an army of gun-toting men mean. 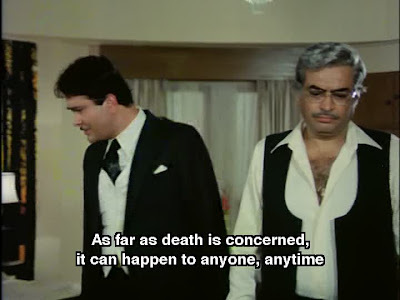 On a not particularly related point, I found it surprising that Randhir is actually nine years younger than Shashi; at this point in their individual Dreaded Male Kapoor Aging Arcs, they almost look the opposite. This is another film where women don't have much to do. 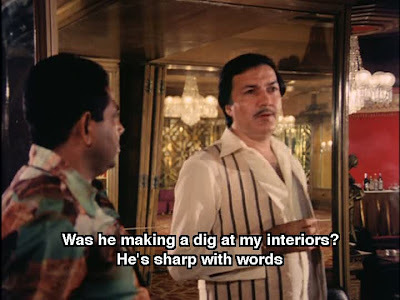 Waheeda Rehman is excellent, of course, as Dhanpathrai's wife Anju, and her character handles the discovery of his duplicitous life with a fairly strong backbone. Unfortunately, she and Sonia are basically reduced to being pawns once Shamsher captures them and holds them as collateral in his fight against the police. Which brings me to a question of my own I've been wanting to investigate for awhile: does anyone else find it extra skeezy when villains force the "good" female characters to watch the sexually explicit and/or for-male-pleasure dances by the "bad" ones? 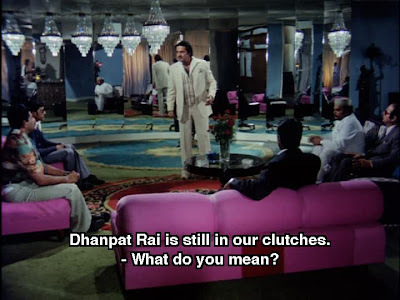 Near the end of this film, Shamsher ties up Anju and Sonia in his hideout [I just typed that as "hideous" and am delighted two words are just one letter apart] (actually a hotel ballroom, I'm sure) and makes them witness scenes like this in "Dilruba Hoon Dilruba." Do click on the right picture to get an up-close look at that magnificent eyeshadow. Who is this dancer, by the way? 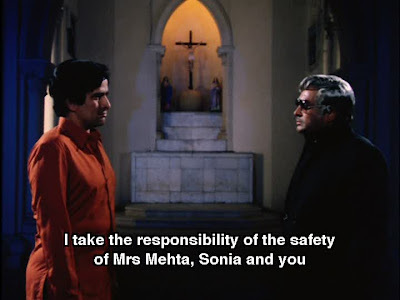 I love this sequence: she snaps her fingers in Shashi's face and then says "Look over here." So direct! So commanding! 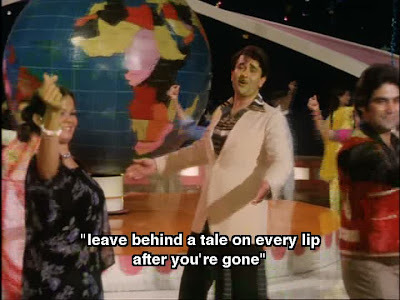 and the other features two more excellent dancers I cannot identify in a qawwali for the villains. Note the box of Johnny Walker on top. 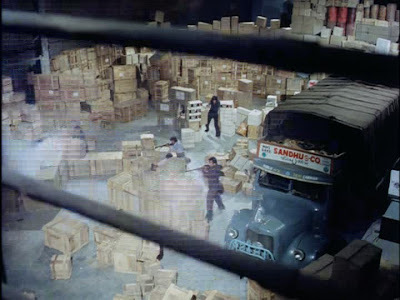 I like to think these crates got re-used throughout the 70s and 80s. Oh the stories they could tell. 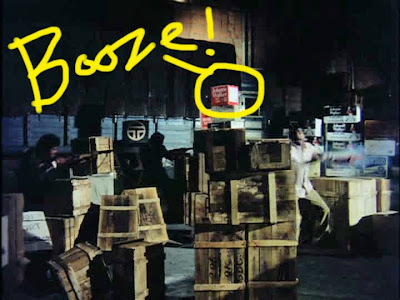 and random groovy extras, like these rainbow time zone clocks and a pink sofa in one of the villain hangouts. The camera crew gets in on the fun with some usefully artsy shots. 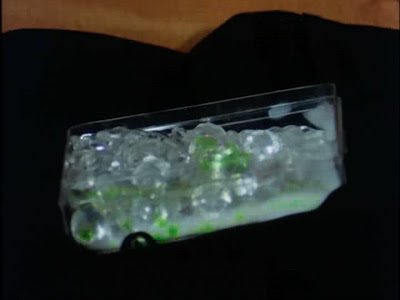 and an important summit between the smuggler and the cop at a church. 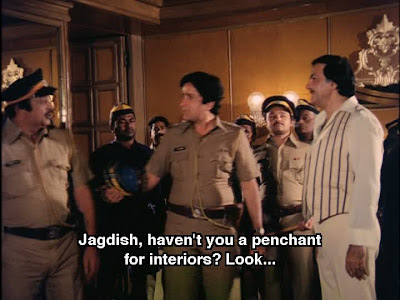 And although Randhir's attempts at comedy in Vicky were not at all to my liking, this exchange between Ravi and one of his officers made my self-reference-loving heart leap with joy. 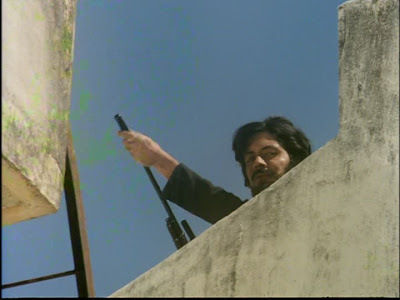 When paying an unannounced visit on Shamsher as they search for the missing Sonia and Anju, Ravi and his crew quickly come up with a great ruse to search the place. Oh how I wish I'd had these in time for the 70s interiors post! 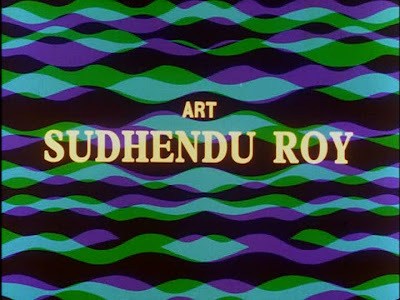 And speaking of visual style, how about these titles? 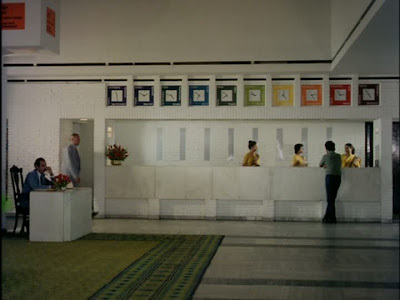 For me, Sawaal was a bit of a wash. 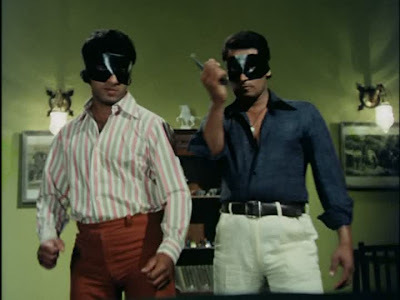 It starts out with a bang - Shashi chasing a thief on a train while Randhir romances Swaroop in "Maana Churaoge Badan" - but quickly fades in intensity and interest. I don't think I really got it (if in fact there was anything to get) and none of the story or performances moved me, but it certainly wasn't bad. 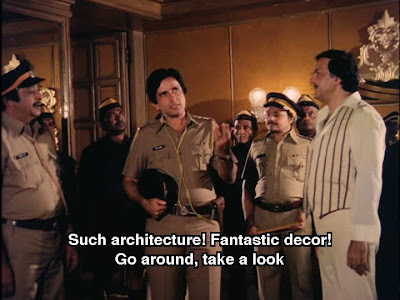 Shashi and Sanjeev bring a sort of weariness to their characters that was quite appropriate, if perhaps not as emotionally satisfying as more buoyant or passionate people they've played in other films. 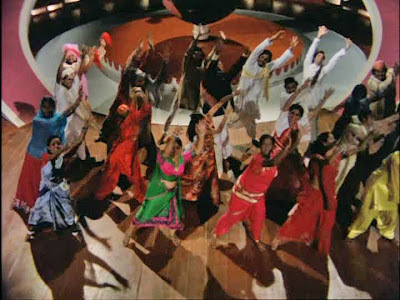 The three songs picturized on female dancers who aren't otherwise in the film may have been Sawaal's strongest, most definitive features (and the music by Khayyam was solid throughout). 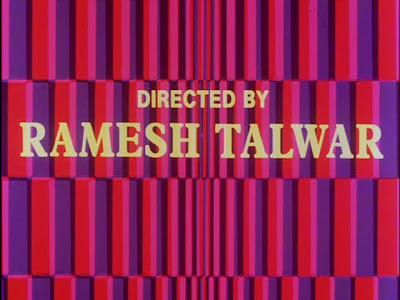 Happily, Yash Raj Films has posted the original trailer, so you can make up your mind just like original audiences did. * Figuring out Poonam Dhillon's age is a little tricky. 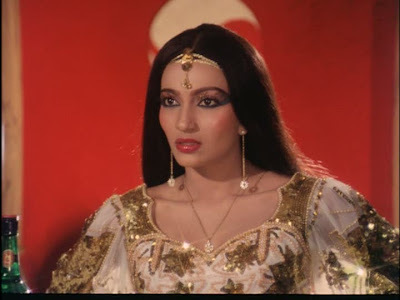 Some sites list her as born in 1956, but her own website says she was 16 when she made Trishul and 17 when she was offered Noorie, which were released in 1978 and 1979 respectively, so by that math she was born around 1962. Shrug. Either way, I think she and Shashi look very weird as a couple. ** This one's for you, Temple and crew! 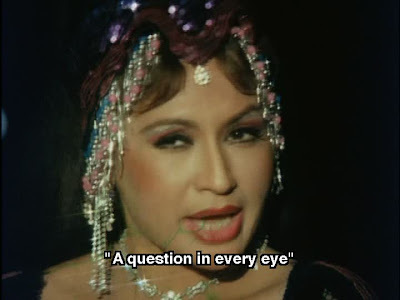 Your first unknown dancer looks like Kalpana Iyer. Unknown dancer #2 looks like Padma Khanna - though I'd have thought that she'd look a lot older in 1982! 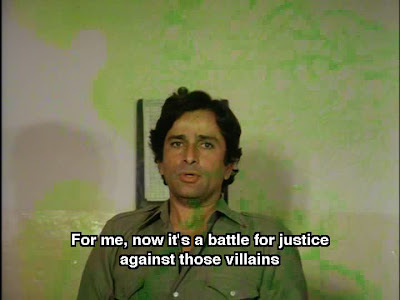 Well, Shashi still looks pretty good in the screenshots! This one seems to have a Trishul kind of hangover. 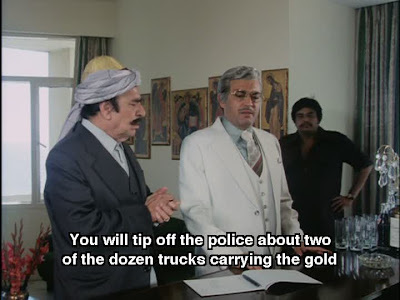 And Poonam Dhillon was the kid sister there. Shashi looks a very fit 44, they say it was his wife that made him restrict his diet and drinks. That explains how he bloated up as soon as she was gone. 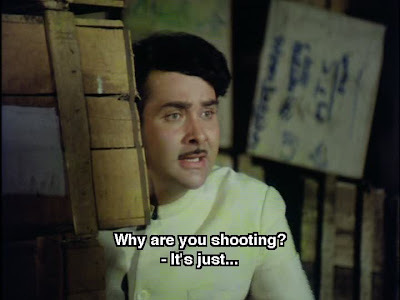 Gosh.. Randhir Kapoor, if you want to irritate yourself more, watch Jawani Diwani. 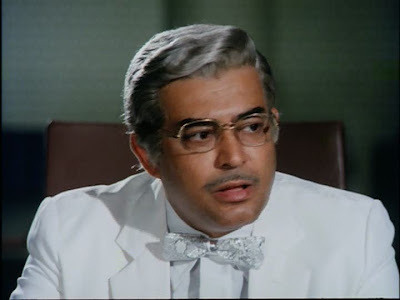 Speaking as the type to chase 44 year olds, I'd say Shashi is looking very, very good, but since we can't all have my skewed since of morality, I won't comment on the age difference and my...OKayness of it. I love the vocabulary they use in subtitles. Penchant, you'd never hear that anywhere else. Nice post as usual. I think I'll give this one a miss since you've covered the pros and cons of watching it. Used to have a crush on Poonam Dhillon after watching "Yeh Vada Raha". Don't think I could stomach this one. 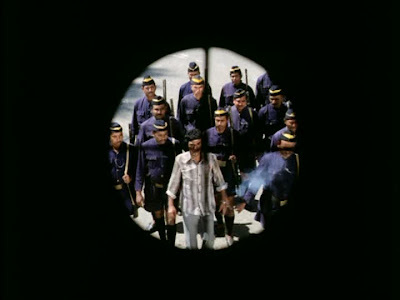 this film I didn't watch it yet..
Looks like sheer masala madness! About the two dancer girls - on left it's Padma Khanna and on right is the girl who plays Govinda's sister in Marte Dam Tak. That should make her Bandini Mishra? I am guessing. That's a pity I've found this "Week" just now, 3 weeks after its end... As usual Beth is witty, and according the contradictive human nature I want to watch now the movie she critisizes so sharply. But probably it was not a good idea to begin sbd's week with critisizing (sometimes tactless)?.. And as for me, it sounds strange to consider "old" (!) a man of 44, so much the more - so handsome?..